Small GPS receiver, designed as personal training assistant and bike computer with high-sensitive antenna, large, easy to read color display, USB interface and support for Strava-Live-Segments. Faster and more precise position tracking thanks to additional support for GLONASS satellites. As a personal training assistant, the GARMIN Edge 520 records the travelled path (track), distance, time, computes the calories burned and helps to achieve your personal workout goals. The device is very easy to use, supports multiple languages and has an extremely sensitive antenna. It is the perfect partner for any biking activities. The built-in USB interface supports data exchange with a PC. 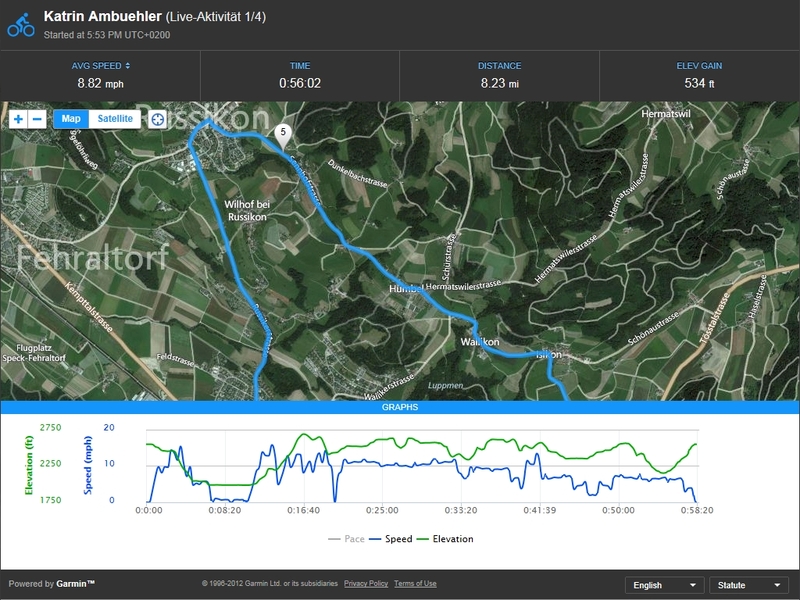 Compatible with Strava-Live-Segments, free 3 months subscription for Strava Premium included. If you have an iPhone or an Android smartphone, you may connect it with your Edge 520 using Bluetooth. Use this feature to download up-to-date weather forecasts and to share your position and workout data with your friends in real-time (live tracking). 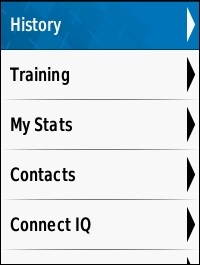 The free App Garmin Connect Mobile must be installed on your smartphone in order to use this functionality. This device is especially well suited to provide information about your outdoor activities (track, speed, maximum speed, distance, elevation profile, time a.s.o.). The coordinates of the current location are shown on the satellite page. The device also shows the current location on the map in relation to user defined or downloaded routes (so called courses). Please find a table with detailed technical data in our Buyer's guide. Integrated antenna to receive signals of GPS and GLONASS satellites. The accuracy of the position tracking gets increased by combining the two systems because there are usually more satellites visible. Chest belt with heart rate monitor. The chest belt uses a digitally coded signal, which means, once a heart beat sensor and the GPS have been paired, the GPS will never receive a conflicting signal from another sensor. So you can exercise in close proximity to other sensors without fear of interference. Heart rate monitor either included in the package or available as an option. Activity profiles: Each profile provides up to 5 general training pages each with 1 to 10 data fields, a map page, a compass page, an elevation page, a lap summary page, a virtual partner page, a cycling dynamics page, and a light network page. You can turn on or off each page. 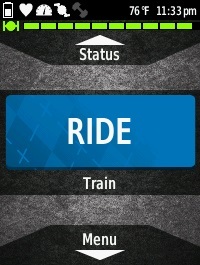 You may also configure a default ride type (e.g. road, mountain, indoor, eBike a.m.m. 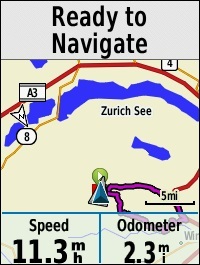 ), a GPS mode, the map (orientation, auto zoom and guide text), alerts (e.b. 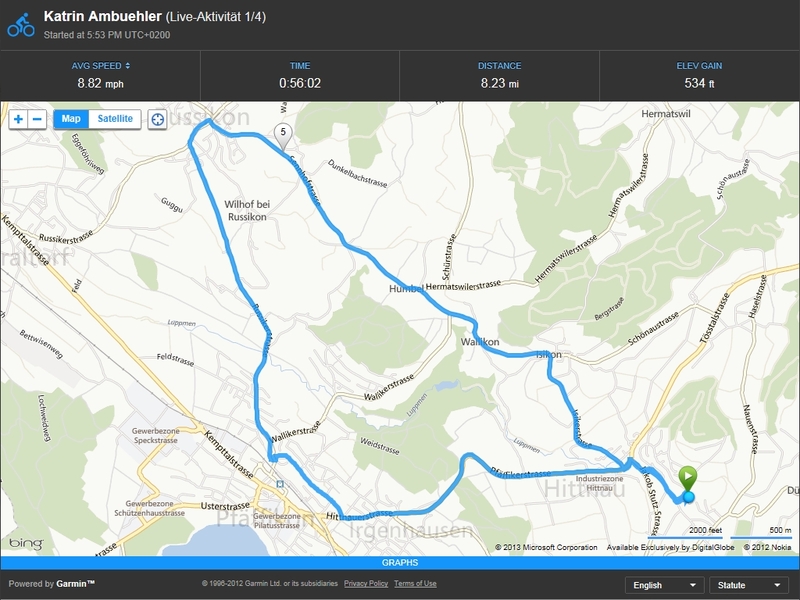 time, distance, heart rate, workout target a.m.m. ), auto features (auto lap, auto pause, auto sleep, auto scroll), start notice when you begin an activity. You may add, modify and remove profiles. Stop watch with split times (laps). Records split times either manually by pressing the "lap" key or automatically based on a user defined distance or position. Auto pause: Stops the watch automatically if the current speed drops below a user defined value, e.g. when waiting at a red light or during a short break. Distance alert: Goes off after you have travelled a user defined distance. The alert can be set to go off only once or repetitive. Time alert Goes off after a user defined time period. The alert can be set to go off only once or repetitive. 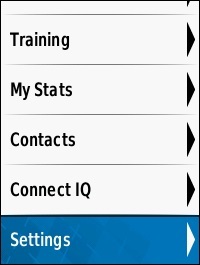 Virtual Partner: This unique feature helps you to achieve certain goals for your workout. The goals are based on a previous drive over the same track or on a course downloaded over the Internet. You may adjust the time for your current workout. The virtual partner will keep exactly the speed required to achieve the goal you have set. The Edge 520 will constantly measure your current speed and compares it to the virtual partner's speed. It will ask you to speed up or slow down as needed and it shows on the display whether you are ahead or behind your virtual partner. History: The Edge 520 keeps track of your workouts. It stores the date, time, number of laps, duration, distance, average speed, calories burned, average and maximum heart rate on a daily basis. 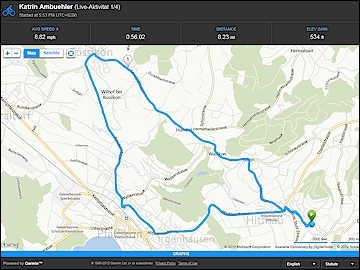 It also provides weekly overviews and running totals for the duration, distance and calories burned. Stores up to 180 hours of training data. Supports metric and U.S. units. Hint: The images below show the display of the Edge 520 in true resolution (176x220 pixels). This does not necessarily mean that the display is shown it its true size (35x44 mm). The actual size of these images depends on the properties of your display. Many of the pages are configurable, the pictures shown are just examples. For the data fields, there is a choice of 138 different values grouped in 15 categories, see selection. There is a choice of 138 different values grouped in 15 categories, see selection. The data gets updated every 60 seconds. Requires the person performing the activity to carry a compatible smartphone with the App Garmin Connect Mobile installed and having an active network connection. For each data field, you can choose one from the following 138 values. For faster access, the values are grouped in 15 categories. You can configure the device to show values in english or metric units. For detailed information about power metrics, see normalized power (NP), intensity factor (IF), and training-stress-score (TSS) as well as training stress scores (TSS) provided by TrainingPeaks. 1 Cadence Cadence Revolutions of the crank arm (cadence) per minute (requires a speed and cadence sensor which is included in the pack but is also available as an option). 2 Cadence Average Average cadence for the current activity (requires a speed and cadence sensor which is included in the pack but is also available as an option). 3 Cadence Lap Average cadence for the current lap (requires a speed and cadence sensor which is included in the pack but is also available as an option). 4 Calories Calories Calories burned during this activity. 5 Courses Course Point Distance Remaining distance to the next point on the current course. 6 Distance to Destination Distance to the final destination of the current course. 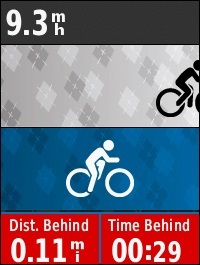 7 Distance to Go Remaining distance to reach the distance target set by the current course or workout. 8 Distance to Next Remaining distance to the next waypoint of the current course. 9 ETA at Destination Estimated arrival time at the final destination of the current course. 10 ETA at Next Estimated arrival time at the next waypoint of the current course. 11 Heading Current moving direction. 12 Location at Destination Name of the waypoint at the final destination of the current course. 13 Location at Next Name of the next waypoint of the current course. 14 Time to Destination Remaining time to reach the final destination of the current course. 15 Time to Go Remaining time to reach the time target set by the current workout. 16 Time to Next Remaining time to reach the next waypoint of the current course. 17 Cycling Dynamics PCO Platform center offset, the location on the pedal platform where force is applied (requires optional Vector power meter). 18 PCO - Average The average platform center offset for the current activity (requires optional Vector power meter). 19 PCO - Lap The average platform center offset for the current lap (requires optional Vector power meter). 20 Power Phase - Left Current power phase angle for the left leg. Power phase is the pedal stroke region where positive power is produced (requires optional Vector power meter). 21 Power Phase - Left Average Average power phase angle for the left leg for the current activity (requires optional Vector power meter). 22 Power Phase - Left Lap Average power phase angle for the left leg for the current lap (requires optional Vector power meter). 23 Power Phase - Left Peak Current power phase peak angle for the left leg. (requires optional Vector power meter). 24 Power Phase - Left Peak Average Average power phase peak angle for the left leg for the current activity (requires optional Vector power meter). 25 Power Phase - Left Peak Lap Average power phase peak angle for the left leg for the current lap (requires optional Vector power meter). 26 Power Phase - Right Current power phase angle for the right leg. Power phase is the pedal stroke region where positive power is produced (requires optional Vector power meter). 27 Power Phase - Right Average Average power phase angle for the right leg for the current activity (requires optional Vector power meter). 28 Power Phase - Right Lap Average power phase angle for the right leg for the current lap (requires optional Vector power meter). 29 Power Phase - Right Peak Current power phase peak angle for the right leg (requires optional Vector power meter). 30 Power Phase - Right Peak Average Average power phase peak angle for the right leg for the current activity (requires optional Vector power meter). 31 Power Phase - Right Peak Lap Average power phase peak angle for the right leg for the current lap (requires optional Vector power meter). 32 Time Seated Time spent seated while pedaling for the current activity (requires optional Vector power meter). 33 Time Seated Lap Time spent seated while pedaling for the current lap (requires optional Vector power meter). 34 Time Standing Time spent standing while pedaling for the current activity (requires optional Vector power meter). 35 Time Standing Lap Time spent standing while pedaling for the current lap (requires optional Vector power meter). 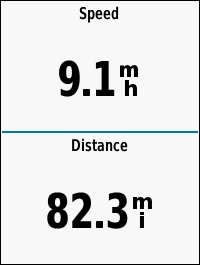 36 Distance Distance Distance travelled during this activity. 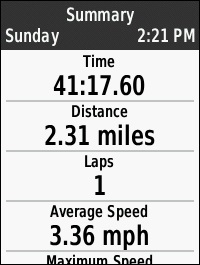 37 Distance - Lap Distance travelled during this lap. 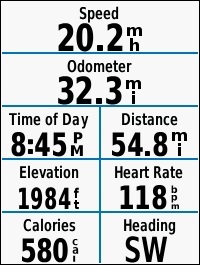 38 Distance - Last Lap Distance travelled during the last completed lap. 39 Distance Ahead Distance ahead of or behind the virtual partner. 40 Odometer Accumulated distance travelled during all activities since last reset of this counter. 41 Elevation Elevation Current elevation above sea level. 42 Grade Current grade computed from elevation change over distance. 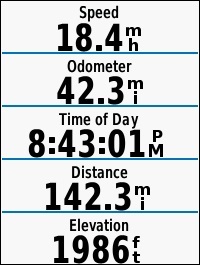 43 Total Ascent Total elevation gain during the current activity. 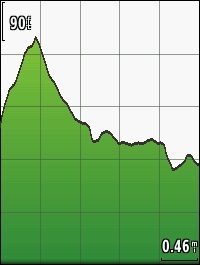 44 Total Descent Total elevation loss during the current activity. 45 Vertical Speed Current rate of ascent or descent. 46 VS - 30s Average Average vertical speed during the last 30 seconds moving. 47 Gears Di2 Battery Level Battery level of the Di2 shift gear motor. 48 Di2 Shift Mode Current mode of the Di2 shift gear. 49 Front Gear Current gear selected on the front wheel of the Di2 shift gear. 50 Gear Battery Battery level of the Di2 sensor gear shift. 51 Gear Combo Combo bike gear from a Di2 sensor. 52 Gear Ratio The ratio of the teeth of the front and the rear wheel of the Di2 shift gear. 53 Gears Current gears selected on the front wheel and on the rear wheel of the Di2 shift gear. 54 Rear Gear Current gear selected on the rear wheel of the Di2 shift gear. 55 General Battery Level Current charge level of the battery. 56 GPS Accuracy Current accuracy of the position determined by the GPS. 57 GPS Signal Strength Current strength of the satellites' signals. 58 Heading Current moving direction. 59 Sunrise Time of sunrise at the current position. 60 Sunset Time of sunset at the current position. 61 Temperature Current ambient temperature. 62 Time of Day Current time of day. 63 Heart Rate Heart Rate Current heart rate (heart beats per minute, bpm) (requires heart rate monitor which is included in the pack but is also available as an option). 64 HR - %HRR Percentage of heart rate reserve (heart rate reserve, HRR = maximum heart rate minus resting heart rate; requires heart rate monitor which is included in the pack but is also available as an option). 65 HR - %Max. Percentage of maximum heart rate (requires heart rate monitor which is included in the pack but is also available as an option). 66 HR - Average Average heart rate for this activity (requires heart rate monitor which is included in the pack but is also available as an option). 67 HR - Average %HRR Average percentage of heart rate reserve for this activity (heart rate reserve, HRR = maximum heart rate minus resting heart rate; requires heart rate monitor which is included in the pack but is also available as an option). 68 HR - Average %Max. Average percentage of maximum heart rate for this activity (requires heart rate monitor which is included in the pack but is also available as an option). 69 HR - Lap Average heart rate for this lap (requires heart rate monitor which is included in the pack but is also available as an option). 70 HR - Lap %HRR Average percentage of heart rate reserve for this lap (heart rate reserve, HRR = maximum heart rate minus resting heart rate; requires heart rate monitor which is included in the pack but is also available as an option). 71 HR - Lap %Max Average percentage of maximum heart rate for this lap (requires heart rate monitor which is included in the pack but is also available as an option). 72 HR - Last Lap Average heart rate for the last completed lap (requires heart rate monitor which is included in the pack but is also available as an option). 73 HR Graph Graphical representation of the heart rate zone over time (requires heart rate monitor which is included in the pack but is also available as an option). 74 HR Zone Current heart rate zone (1..5). Default zones are based on the user profile, the maximum heart rate and the rest heart rate, but may be changed by the user (requires heart rate monitor which is included in the pack but is also available as an option). 75 Time in HR Zone 1 Time elapsed in heart rate zone 1 (requires heart rate monitor which is included in the pack but is also available as an option). 76 Time in HR Zone 2 Time elapsed in heart rate zone 2 (requires heart rate monitor which is included in the pack but is also available as an option). 77 Time in HR Zone 3 Time elapsed in heart rate zone 3 (requires heart rate monitor which is included in the pack but is also available as an option). 78 Time in HR Zone 4 Time elapsed in heart rate zone 4 (requires heart rate monitor which is included in the pack but is also available as an option). 79 Time in HR Zone 5 Time elapsed in heart rate zone 5 (requires heart rate monitor which is included in the pack but is also available as an option). 80 Indoor Trainer Target Power Target power output during an activity (requires optional 3rd party indoor trainer). 81 Trainer Resistance Resistance force applied by an indoor trainer (requires optional 3rd party indoor trainer). 82 Lights Battery Status Battery level of the connected lights (requires optional 3rd party light). 83 Beam Angle Status Beam angle of the connected lights (requires optional 3rd party light). 84 Light Mode Mode of the connected lights (requires optional 3rd party light). 85 Lights Connected List of the connected lights (requires optional 3rd party light). 86 Power Balance Contribution of the left and the right leg to the total power output in percent (requires optional 3rd party power meter). 87 Balance - 3s Average Average contribution of the left and the right leg to the total power output during the last 3 seconds in percent (requires optional 3rd party power meter). 88 Balance - 10s Average Average contribution of the left and the right leg to the total power output during the last 10 seconds in percent (requires optional 3rd party power meter). 89 Balance - 30s Average Average contribution of the left and the right leg to the total power output during the last 30 seconds in percent (requires optional 3rd party power meter). 90 Balance - Average Average contribution of the left and the right leg to the total power output during this activity in percent (requires optional 3rd party power meter). 91 Balance - Lap Average contribution of the left and the right leg to the total power output during the current lap in percent (requires optional 3rd party power meter). 92 Pedal Smoothness Average torque in percent of the maximum torque of the cranks (requires optional 3rd party power meter). 93 Power Current power output (requires optional 3rd party power meter). 94 Power - %FTP Current power output in %FTP ("Functional Threshold Power") (requires optional 3rd party power meter). 95 Power - 3s Average Average power output during the last 3 seconds moving (requires optional 3rd party power meter). 96 Power - 10s Average Average power output during the last 10 seconds moving (requires optional 3rd party power meter). 97 Power - 30s Average Average power output during the last 30 seconds moving (requires optional 3rd party power meter). 98 Power - Average Average power output during this activity (requires optional 3rd party power meter). 99 Power - IF Intensity Factor: The ratio of the Normalized Power (NP) to the functional threshold power (FTP), see TrainingPeaks for details (requires optional 3rd party power meter). 100 Power - kJ Current power output in kilojoule (requires optional 3rd party power meter). 101 Power - Lap Average power output during this lap (requires optional 3rd party power meter). 102 Power - Lap Max. Maximum power output achieved during the current lap (requires optional 3rd party power meter). 103 Power - Last Lap Average power output during the last completed lap (requires optional 3rd party power meter). 104 Power - Max. Maximum power output achieved during this activity (requires optional 3rd party power meter). 105 Power - NP Normalized Power: An estimate of the power that one could have maintained for the same physiological "cost" if the power had been perfectly constant during the current workout, see TrainingPeaks for details (requires optional 3rd party power meter). 106 Power - NP Lap Normalized Power Lap: An estimate of the power that one could have maintained for the same physiological "cost" if the power had been perfectly constant during the current lap, see TrainingPeaks for details (requires optional 3rd party power meter). 107 Power - NP Last Lap Normalized Power Last Lap: An estimate of the power that one could have maintained for the same physiological "cost" if the power had been perfectly constant during the last completed lap, see TrainingPeaks for details (requires optional 3rd party power meter). 108 Power - TSS Training Stress Score: A composite number that takes into account the duration and intensity of a workout to arrive at a single estimate of the overall training load and physiological stress created by that training session, see TrainingPeaks for details (requires optional 3rd party power meter). 109 Power - Watts/kg Power output in watts per kilogram of your body weight (requires optional 3rd party power meter). 110 Power Zone Current power zone (1..7). The zones are based on your FTP or user settings (requires optional 3rd party power meter). 111 Time in Power Zone 1 Time elapsed in power zone 1 (requires optional 3rd party power meter). 112 Time in Power Zone 2 Time elapsed in power zone 2 (requires optional 3rd party power meter). 113 Time in Power Zone 3 Time elapsed in power zone 3 (requires optional 3rd party power meter). 114 Time in Power Zone 4 Time elapsed in power zone 4 (requires optional 3rd party power meter). 115 Time in Power Zone 5 Time elapsed in power zone 5 (requires optional 3rd party power meter). 116 Time in Power Zone 6 Time elapsed in power zone 6 (requires optional 3rd party power meter). 117 Time in Power Zone 7 Time elapsed in power zone 7 (requires optional 3rd party power meter). 118 Time in Power Zone 8 Time elapsed in power zone 8 (requires optional 3rd party power meter). 119 Time in Power Zone 9 Time elapsed in power zone 9 (requires optional 3rd party power meter). 120 Torque Effectiveness Sum of clockwise pedaling power minus anti-clockwise drag (requires optional 3rd party power meter). 121 Speed Speed Current speed (distance per time unit). 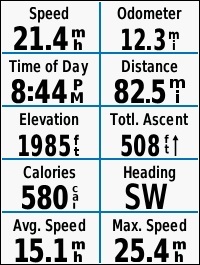 122 Speed - Average Average speed for current activity. 123 Speed - Lap Average speed for current lap. 124 Speed - Last Lap Average speed for the last completed lap. 125 Speed - Max. 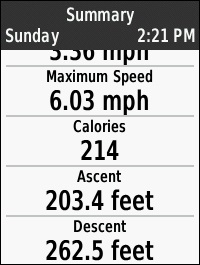 Maximum speed for current activity. 126 Timer Laps Number of completed laps. 127 Time Stopwatch time for the current activity. 128 Time - Average Lap Average time for all completed laps. 129 Time - Elapsed Duration of the current activity including stopped time. 130 Time - Lap Elapsed time for the current lap. 131 Time - Last Lap Duration of the last completed lap. 132 Time Ahead Time ahead of or behind the virtual partner. 133 Workouts Calories to Go Remaining calories to reach the target set by the current workout. 134 Distance to Go Remaining distance to reach the distance target set by the current course or workout. 135 HR to Go During a workout, the amount you are above or below the heart rate target. 136 Reps to Go Remaining number of repetitions to go to reach the target set by the current workout. 137 Time to Go Remaining time to reach the time target set by the current workout. 138 Workout Step During a workout, the current step out of the total number of steps. 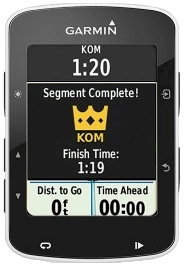 All options for the GARMIN Edge 520 in detail. Here we provide additional documentation and software updates related to the Edge 520. Click on the price or the shopping basket symbol to add the item you wish to purchase to the shopping basket. Your browser must accept cookies, otherwise the shopping basket won't work.